Children who present with transient loss of consciousness (T-LOC) are often first seen in emergency departments (EDs). Reflex anoxic seizure (RAS), vasovagal syncope and prolonged respiratory apnoea are benign, syncopal events that can be generally managed by explanation and reassurance. RAS is a short, paroxysmal, self-reverting episode of asystole that is triggered by pain, fear or anxiety and is caused by increased vagal response. It is an important differential diagnosis in pre-school age children who present with T-LOC, but is often underdiagnosed and can sometimes be misdiagnosed as epilepsy. Nurses working in EDs are among the first healthcare professionals to see children in acute settings and should therefore be aware of RAS, the presenting features and management options. 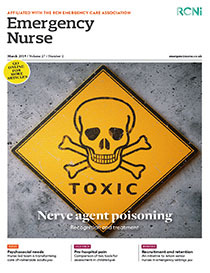 This article discusses the epidemiology, pathophysiology and management of RAS, includes an illustrative case study and discusses the role of ED nurses.